Our ever blooming Pleurothallis titan ‘Lexie’s Butterflies’ AM/AOS was recently awarded! 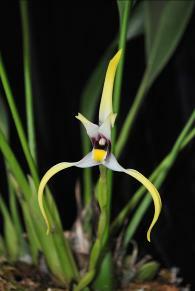 River Valley Orchids specializes in primarily new world orchid species from Ecuador, Colombia and Peru. Our favorites are Phragmipedium, Maxillaria, Brassia, Tolumnia, Scaphasepalum, Stanhopea and the Pleurothallis group. We are primarily a hobbyist grower, however, we do offer plants for sale and trade. Please contact us if you are looking for something in particular. We do very much enjoy visiting orchid societies to provide various talks and plants for sale. Please see our services page for more information.